Thyroid Disease, Thyroid Cancer, Thyroid Nodules, Thyroid Hormone, Thyroid Function, Thyroid Surgery, Thyroid Ultrasound, Thyroid X-Rays, Thyroid Drugs, and all other Thyroid Problems and their Treatments. 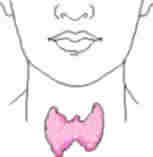 The thyroid gland is the biggest gland in the neck. It is situated in the anterior (front) neck below the skin and muscle layers. The thyroid gland takes the shape of a butterfly with the two wings being represented by the left and right thyroid lobes which wrap around the trachea. The sole function of the thyroid is to make thyroid hormone. This hormone has an effect on nearly all tissues of the body where it increases cellular activity. The function of the thyroid therefore is to regulate the body's metabolism. The thyroid gland is prone to several very distinct problems, some of which are extremely common. These problems can be broken down into  those concerning the production of hormone (too much, or too little),  those due to increased growth of the thyroid causing compression of important neck structures or simply appearing as a mass in the neck,  the formation of nodules or lumps within the thyroid which are worrisome for the presence of thyroid cancer, and  those which are cancerous. Each thyroid topic is addressed separately and illustrated with actual patient x-rays and pictures to make them easier to understand. The information on this web site is arranged to give you more detailed and complex information as you read further. Goiters ~ A thyroid goiter is a dramatic enlargement of the thyroid gland. Goiters are often removed because of cosmetic reasons or, more commonly, because they compress other vital structures of the neck including the trachea and the esophagus making breathing and swallowing difficult. Sometimes goiters will actually grow into the chest where they can cause trouble as well. Several nice x-rays will help explain all types of thyroid goiter problems. Thyroid Cancer ~ Thyroid cancer is a fairly common malignancy, however, the vast majority have excellent long term survival. We now include a separate page on the characteristics of each type of thyroid cancer and its typical treatment, follow-up, and prognosis. Over 30 pages thyroid cancer. Solitary Thyroid Nodules ~ There are several characteristics of solitary nodules of the thyroid which make them suspicious for malignancy. Although as many as 50% of the population will have a nodule somewhere in their thyroid, the overwhelming majority of these are benign. Occasionally, thyroid nodules can take on characteristics of malignancy and require either a needle biopsy or surgical excision. Now includes risks of radiation exposure and the role of Needle Biopsy for evaluating a thyroid nodule. Also a new page on the role of ultrasound in diagnosing thyroid nodules and masses. Hyperthyroidism ~ Hyperthyroidism means too much thyroid hormone. Current methods used for treating a hyperthyroid patient are radioactive iodine, anti-thyroid drugs, or surgery. Each method has advantages and disadvantages and is selected for individual patients. Many times the situation will suggest that all three methods are appropriate, while other circumstances will dictate a single best therapeutic option. Surgery is the least common treatment selected for hyperthyroidism. The different causes of hyperthyroidism are covered in detail. Hypothyroidism ~ Hypothyroidism means too little thyroid hormone and is a common problem. In fact, hypothyroidism is often present for a number of years before it is recognized and treated. There are several common causes, each of which are covered in detail. Hypothyroidism can even be associated with pregnancy. Treatment for all types of hypothyroidism is usually straightforward. Thyroiditis ~ Thyroiditis is an inflammatory process ongoing within the thyroid gland. Thyroiditis can present with a number of symptoms such as fever and pain, but it can also present as subtle findings of hypo or hyper-thyroidism. There are a number of causes, some more common than others. Each is covered on this site.